Welcome to a joint event organized with the Foreign Policy Association in Lund on 26 September at 19.00. By the end of 2017, the number of China Internet users totaled 772 million, with a penetration rate of 55.8%. The Chinese government has embarked on a comprehensive strategy of applying information and communication technologies (ICT) and big data solutions in different realms, including governance and commerce. China has also become a leader in developing artificial intelligence (AI) and different surveillance technologies (for example facial recognition technologies). 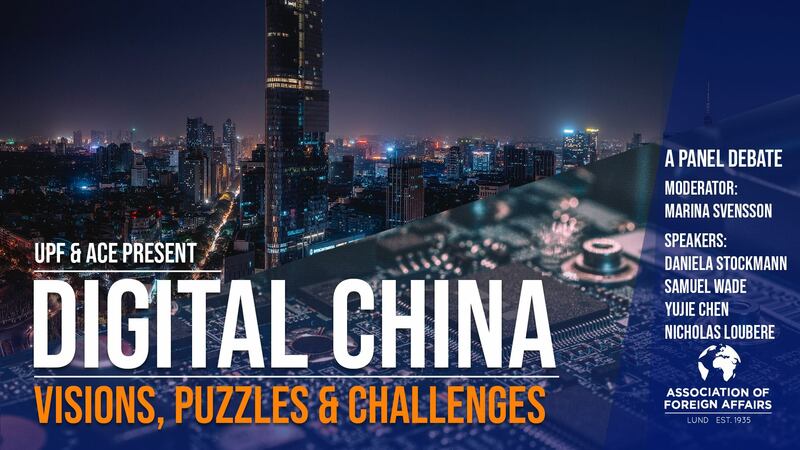 How should we understand the Chinese puzzle, where rapid informatisation, digitisation, and innovation in ICTs are the result of both heavy state investment and rapid market developments that co-exist with censorship and a lack of freedom of expression? What are the implications for the rest of the world and global Internet governance? What are the views on the ground and how do Chinese people actually use ICTs? This panel debate brings together scholars from different fields for a discussion on the visions, practices, and dynamics of digital China.